The Devil’s Looking-Glass is Simon Rees’ first book. It’s the tale of two Cambridge faculty members, Born and Thomas, who conduct experiments in ESP. It is John Born who is the willing subject of these experiments and his friend, Thomas, who conducts the experiments and then records the results. When the rather dark character of Doctor Wiston becomes involved with the two men the experiments start to take Born into darker territories than normal and he becomes obsessed with a black obsidian mirror called The Devil’s Looking-Glass. The Devil’s Looking-Glass is only 188 pages long, but I was in two minds about finishing it. If the book was any longer I probably wouldn’t have bothered. I did not enjoy the story at all and found it hard to like or identify with any of the characters in the book. This meant that I didn’t care in the slightest what happened to any of them, so I did not care for the book. The Devil’s Looking-Glass was first published in 1985. 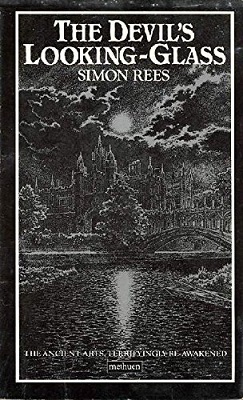 It was a runner-up for The Betty Trask Award, so obviously many other readers must have enjoyed this strange, dark, and boring journey into the occult. If your usual reading matter includes the works of writers such as Stephen King, Dean Koontz, and Richard Laymon etc., the chances are you probably won’t enjoy The Devil’s Looking-Glass. Rees’ prose has a rather stuffy and dated feel that is a poor comparison to the crisp, modern styles of the aforementioned writers. When it comes to taste in books though, it’s a case of each to their own. So if you do decide to take a look in The Devil’s Looking-Glass I hope I have, at least, given you an idea of what to expect.